15th Infantry Regiment was organized in August 1861, at Fort Mitchell, Alabama, with eleven companies. The men were recruited in Barbour, Russell, Dale, Henry, Macon, and Pike counties. With more than 900 effectives, it moved to East Tennessee, then Virginia. In Virginia, the unit was assigned to Trimble's Brigade and saw action in Jackson's Valley Campaign. Later it served under Generals Law and W. F. Perry, Army of Northern Virginia. 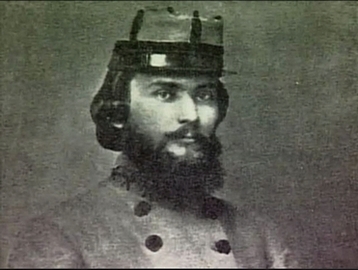 The 15th participated in many conflicts from the Seven Days Battles to Cold Harbor, except when it was with Longstreet at Suffolk, Chickamauga, and Knoxville. It was involved in the battles and hardships of the Petersburg siege and ended the war at Appomattox. This regiment lost 51 men at Cross Keys and Port Republic, 152 during the Seven Days Battles, 112 at Second Manassas, and 84 at Sharpsburg. More than thirty percent of the 499 engaged at Gettysburg were disabled, and it reported 142 casualties at Chickamauga and 91 during The Wilderness Campaign. The unit surrendered with 15 officers and 204 men. Its commanders were Colonels James Cantey, Alexander A. Lowther, William C. Oates, and John F. Treutlen; Lieutenant Colonel Isaac B. Feagin; and Major John W. L. Daniel.